This old cemetery is in Scotland County, NC about 2-1/2 miles from the Hoke County line, and "near Major Jack McNeill's old place." When Margaret McEachin was buried here in 1809 the area was more than likely known as Cumberland County. From Laurinburg go North on Highway 15 about 7 miles to Peach Orchard Road. Turn right on Peach Orchard and travel about 3 miles to Hill Creek Road. Turn right and go about 500 feet to the entrance of S & H Farms. This is private property and visitors should obtain permission to visit the cemetery. 1. James Alexander McEachin, Sr. (1790-1868) married Effie Purcell (1801-1843) who was the daughter of John Purcell (c 1773-1850) and Mary Gilchrist (c 1771-1843). Three of their children, James Alexander, Harriet Atwood and Mary McEachin are buried in this cemetery. Peter McEachin married Nancy Fairley, dau. of Alexander Fairley and Effie McLaurin. Their daughter Margaret, married Mial Wall of Anson County, N.C.
Their children were Sarah, John Daniel & Almonda. Their son was named James. 5. Mary McEachin (1779-1856) married Angus McLean. The family history mentions a daughter named Elisa McLean. 7. Margaret McEachin (1776-1809) married Angus McNeill (c 1762-1835). Records show he was born in 1783. Edward married a Johnson and lived near the old place in upper Robeson County. They had the following children: Major, Daniel J., Evender [Evander], and several daughters. 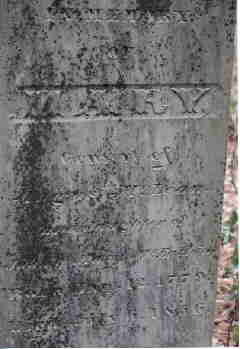 On the bottom right corner of Mary's tombstone is "Lauder Fayett", a mark that can be seen on many old tombstones here. The excellent workmanship of this stone mason reveals the care taken to engrave deeply and precisely into solid granite. His work remains legible today on many very old tombstones in this area. Mary (Currie) McEachin born about 1750 in Scotland, wife of John McEachin, mother of eight or nine children. Illegible (Sep 4, 1999) According to the research of J.D. McEachin this marker once read: In Memory of John McEachin, who was born February 24, 1741, died October 8, 1815. J.D. 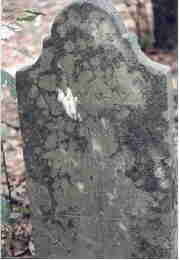 's record for above shows: Margaret McNeill died Jan 15, 1809, 33 years. J.D. 's record shows James Alexander above died August 21, 1828 aged 13 months and 3 days. 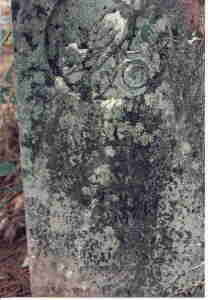 James McEachin Departed (illegible) 3rd day in (illegible) Aged 99 yrs. & 10 mos. This may be the foot marker to Effie's grave. Earlier records show: Sacred to the Memory of Effie, consort of James McEachin, dau. of John Purcell, who departed this life Mar. 23, 1843 Aged 41.